Hands-on learning is an essential element of Montessori education. Students learn to research questions, think critically, communicate effectively, and work collaboratively to master core academic content. Moving beyond the walls of the classroom to local institutions and to the natural landscapes of the North Shore presents new and in-depth ways to investigate, understand and learn. Experience Weeks provide a balance of learning by doing, creating and making. It’s a time for going out into the world, learning independence, interdependence, and the connection between all things and oneself. It’s a time for learning you. I was honored to lead and facilitate two Experience Weeks in March. Take a peek. 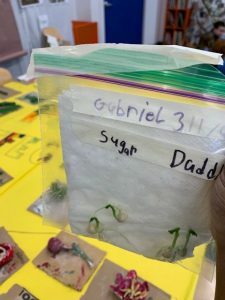 The children’s book called First Peas to the Table: How Thomas Jefferson Inspired a School Garden by Susan Grigsby inspired our Experience Week. Thomas Jefferson, our third president, held a pea-growing contest with his neighbors every spring. The first person to have a bowl of peas ready to bring to the table was declared the winner and would invite his neighbors over dinner that included a dish of peas. Our Experience Week was full of STREAM (science, technology, reading, engineering, art, and math) activities inspired by Grigsby’s book. MATH: Thomas Jefferson designed his garden in 3 categories: Roots, Fruits, and Leaves. This prompted us to examine, taste, and categorize carrots, cabbage, lettuce, radish, cucumbers, tomatoes, peppers, celery, onions, potatoes, and peas. Counting seeds, graphing a garden, measuring how far to plant each seed was fun! Planting peas in March can be tricky when snow is on the ground. This inspired our group to take a closer look at the weather and before we knew it we were making a weather station. Did our zip lock bags with water freeze over night? Was the wind blowing our bells and windsocks?